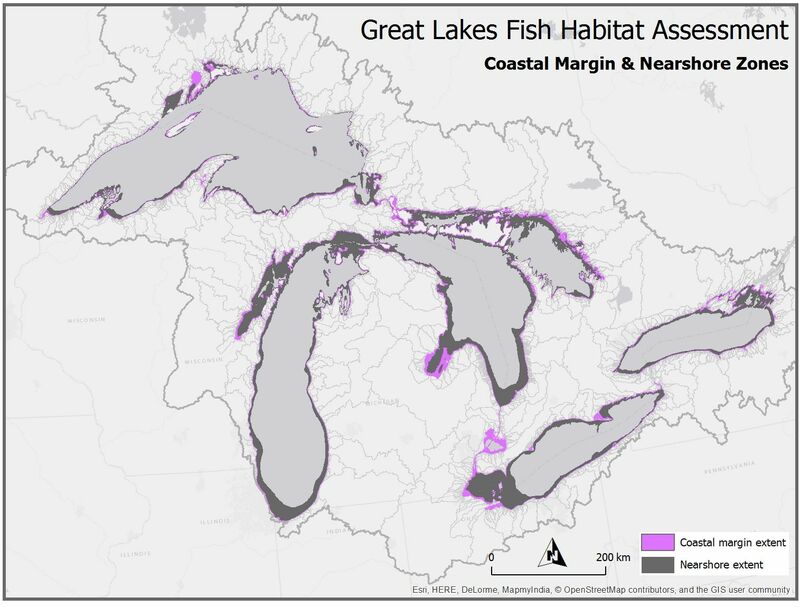 The National Fish Habitat Partnership (NFHP) identified the need for an integrated assessment of coastal and nearshore habitats of the Great Lakes and in 2013 the Great Lakes Basin Fish Habitat Partnership (GLBFHP) funded a composite habitat assessment that includes linkage to the Great Lakes tributary assessment. 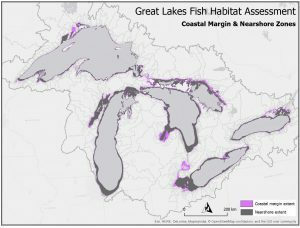 The goal was to assess and map available fish habitat based on species-specific habitat conditions for all five Great Lakes. To interact with all of the Great Lakes coastal and nearshore fish habitat assessment maps visit the GLAHF Explorer and go to the Coastal & Nearshore Fish Habitat Assessment tool . Assembled data: We obtained fish data from the GLEI project, USGS, and multiple state and federal agencies and a suite of environmental and habitat data that was attributed to the GLAHF spatial database. Habitat data were extracted for modeling at each sampling location. The team conducted separate modeling efforts for the coastal margin (<3m depth) and nearshore (3-30m) zones of the Great Lakes. Modeled fish abundance: We developed models that predict fish presence (coastal margin) and abundance (nearshore) patterns from habitat data in the Great Lakes for each fish species. Predicted and mapped fish distribution patterns: We used the abundance model output to predict fish presence or abundance patterns in areas not sampled using the GLAHF framework and mapped these distribution patterns by abundance class for all available fish species. Classified optimal habitat: We classified and mapped optimal habitat from the abundance classes for each fish species in the nearshore zone. 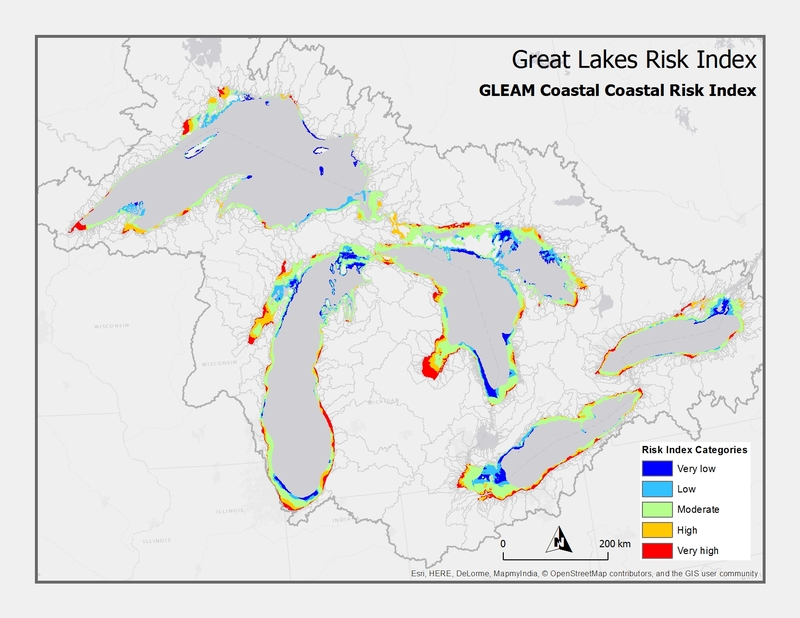 Conducted risk assessment: Using established stress indices developed for the Great Lakes coastal margin and nearshore zones (see Risk Indices below) we identified the risk to optimal habitat in three risk categories: low, medium, and high. Assessed condition and potential: From multi-species predictions, we mapped priority conservation actions based on the condition assessment. For more details read our latest publication on the coastal fish habitat assessment in Kovalenko, et al. (2018). 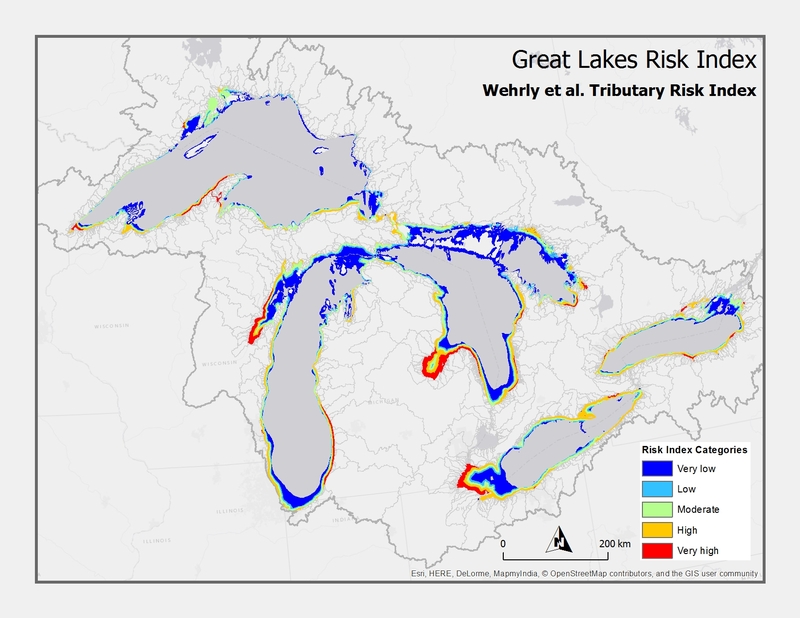 Two Great Lakes risk indices were available for the fish habitat assessment; the Great Lakes Environmental Mapping and Assessment (GLEAM) coastal risk index and the Wehrly et al. tributary risk index. For more details about each of the risk indices, click on the links below.